As the time of deep sleep nears. The bees are very busy now…flying back to the hives, their bodies covered with pollen; the droning sound they make so much a part of the landscape one must pay attention to hear it. Float quick and light, reflecting back to the wind, the earth and the sky the soon to be ghost of Summer. The evening light echoing the beat of my heart. We are still having haze from the fires! Although, and in spite of, yesterday was a lovely fall day. The leaves are just beginning to turn; some are already falling. Not many, one or two, silently, a slight flicker at the edge of eyesight. Sunday we had over thirty of these flying little jewels. Flitting here and there, getting in squabbles with each other, dipping and dodging. I go through a gallon of sugar water every day. After we came in from setting the last of the water, the dappled light from the setting sun, glowing through the haze Terry, Boomer, and I rested before going in. It was at that moment I realized the sounds of the Hummingbirds had dimmed. Only six little birds were visiting the feeders. The same count this morning. The hummingbird migration has begun. I would much prefer Fall/Autumn to begin the last of September, not now, not in August. Still it is here…the sunlight this morning caught in the cobwebs heavily dappled in dew. Many of the other spring and summer birds have left…it won’t be long now until the Swallows leave. They seem to be around the last to go. Not always, but close. I understand why we measure time—for it is the hope that in doing so it will not leave. The storm hit our area yesterday, bringing a strong wind with sleet and rain. Our trees were still hanging onto thier summer leaves, but today, the leaves are all on the ground. 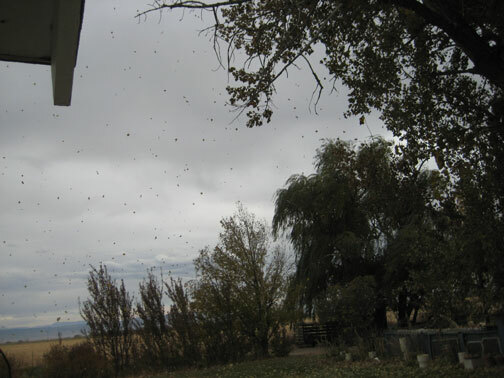 Although this looks like lots of bugs, it is really leaves being pushed off the trees.